Russian physician, and founder of the Jewish National Library at Jerusalem; born at Goniondz, government of Grodno, Russia, Oct. 22, 1844; son of Aaron Chazanowicz. 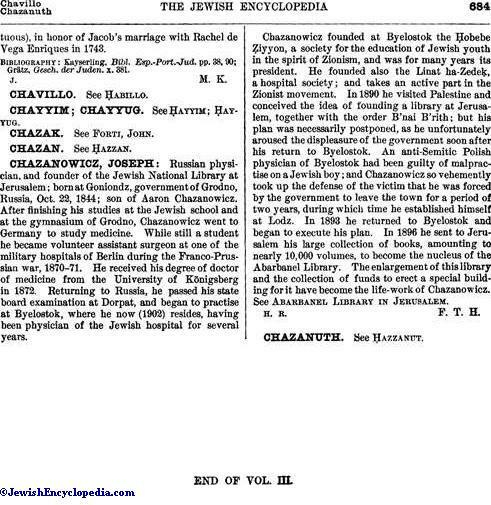 After finishing his studies at the Jewish school and at the gymnasium of Grodno, Chazanowicz went to Germany to study medicine. While still a student he became volunteer assistant surgeon at one of the military hospitals of Berlin during the Franco-Prussian war, 1870-71. He received his degree of doctor of medicine from the University of Königsberg in 1872. Returning to Russia, he passed his state board examination at Dorpat, and began to practise at Byelostok, where he now (1902) resides, having been physician of the Jewish hospital for several years. Chazanowicz founded at Byelostok the Ḥobebe Ẓiyyon, a society for the education of Jewish youth in the spirit of Zionism, and was for many years its president. He founded also the Linat ha-Ẓedeḳ, a hospital society; and takes an active part in the Zionist movement. In 1890 he visited Palestine and conceived the idea of founding a library at Jerusalem, together with the order B'nai B'rith; but his plan was necessarily postponed, as he unfortunately aroused the displeasure of the government soon after his return to Byelostok. An anti-Semitic Polish physician of Byelostok had been guilty of malpractise on a Jewish boy; and Chazanowicz so vehemently took up the defense of the victim that he was forced by the government to leave the town for a period of two years, during which time he established himself at Lodz. In 1893 he returned to Byelostok and began to execute his plan. In 1896 he sent to Jerusalem his large collection of books, amounting to nearly 10,000 volumes, to become the nucleus of the Abarbanel Library. The enlargement of this library and the collection of funds to erect a special building for it have become the life-work of Chazanowicz. See Abarbanel Library in Jerusalem.